Taking place over Friday Saturday and Sunday, July 13, 14 and 15 at the Regent Street campus, Ceramic Wales will showcase works from around fifty makers who work in ceramics and who will be bringing their own products to display and sell. Items will be on sale for anything from £5 to £5000. The free to enter event will also feature works from a number of Glyndŵr students and graduates – including several who are currently exhibiting shows across the country. Explaining what else visitors can expect over the weekend, Wayne Clark, applied arts demonstrator at Wrexham Glyndŵr University and one of the organisers of Ceramic Wales, said: “We have a series of demos and talks from some experts, including one on Saturday from Walter Keeler, a salt glaze ceramicist who is an international expert in his field. “There are also lots of chances for people to get some hands-on experience at the event – there will be a marquee at the front of the building where people can come and have a go at making ceramics, and we will also be running a Raku firing workshop. Wayne added: “This is our third year and students have been involved form the word go – they get to see how an event is put on, to see how a show is run – and to see their work as part of the show too. More information about Wrexham Glyndŵr University’s BA (Hons) Applied Arts course can be found here. 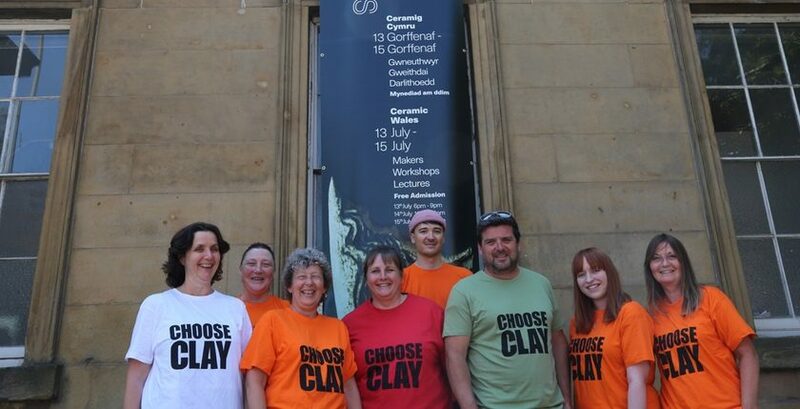 Further details on Ceramic Wales can be found at their website.